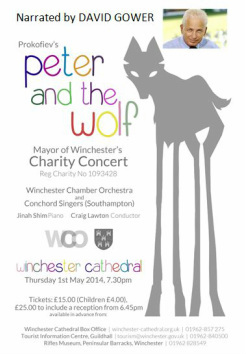 The orchestra was invited by the Mayor to be in their charity concert in the Cathedral. Together with the Concord singers and Jinah Shim we performed on 1st May in aid of charity. We performed Peter and the Wolf with David Gower as the narrator, to a packed audience. Jinah Shim played an unaccompanied piano recital. The concord singers sang several pieces conducted by Craig. The concert raised £8000 for charity.